Howdy friends. Tonight was my first coached running session with Jeff Grant of Hillseeker Fitness. He runs these group sessions once per week in Zürich, on Wednesday nights at 7pm. Based on what I have seen a variety of people of all ages, nationalities and abilities seem to show up. I would estimate that there were around 15 people at tonight's session. We met at the Sihhölzli track in Zürich, although the location sometimes varies and next week for instance we will meet at the Saalsporthalle nearby. The class was a lot of fun and after 2 laps of warming up we started some drills using a set of agility ladders. Jeff placed 2 ladders at right angles and then he would instruct us whether to run straight from one end to the other or whether to run to the junction and then sidestep to the left or right. The aim is to take small, quick, light steps whilst traversing the ladders on the floor. After we finished the agility drills we did a short mental training exercise. He played some music on his laptop, which encouraged box breathing. This apparently is when you breathe in to your belly for x seconds, hold the breath in your belly for x seconds, breathe out for x seconds, wait for x seconds and then begin the whole process over again. Whilst breathing in he would say a phrase such as "Breathe in the energy" and then whilst breathing out he would say something like "Breathe out the tiredness". It was similar to what my yoga teacher says when we are calming down at the end of the lesson, and if you try to listen carefully to the words (and try to follow them too) it does help you to achieve a good mental state. Now that we were mentally prepared he sent us on the track to do two timed 1,600m runs i.e. 4 laps of the track. It was up to us whether we wanted to run the first one faster or the second one faster, but Jeff wanted us to make a good effort for both of them. I chose to go for it on the first 1,600m run. I had no idea how long it would take me, as I have not done a timed 1,600m run since childhood. Luckily there was another very strong runner in the group and I used him to help pace myself. I stayed on his shoulder the whole duration and in the last 200m I tried to pass him but he was a competitive fellow who didn't want to let me pass, and he finished just ahead of me. It took me 5 minutes and 40 seconds to complete. After everyone was back and had had a chance to rest, we did the second timed 1,600m run. This time I was rather tired and I took it much easier. I still came in second though, but my time was 6 minutes and 32 seconds. Then finally to round off the session we did some fun drills. Jeff placed 2 cones on the ground and then we had to form pairs and run between the cones in our pairs doing leapfrog over each other and then bear crawling and then bunny hopping and then a freestyle animal movement (up to us to choose) and then finally normal running. My pair was the winning pair as my competitive nature took over again. I was impressed by how Jeff made the session a lot of fun, so that you didn't really realise what you were doing was hard work when in fact it was. He seems to be passionate about his work and really wants his clients to enjoy their training experience with him. Not everyone in his group is super fast but he still makes them feel good about themselves with his encouraging words. At 25CHF per session it seems like very good value for money. Importantly for me too, it is a great way to meet other runners so I don't have to do all my training alone. There are a couple of other ultra runners in the group. One is running in the Ultra Trail of Mont Blanc this year, and another who was not there tonight just completed the Marathon des Sables like myself so Jeff was telling me. 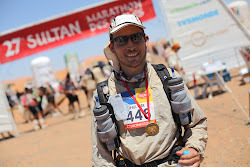 It may even be that I recognise him when he comes to the session next week, as I talked to so many people during the MDS that I lost track of all their names. The sessions could even be something that Anny will enjoy, especially as most of the attendees are female and of a similar level to her. Running brings lot of fun. It is good that we have some workouts in our body. Thanks for sharing this to us. Hi Ragnor Relay. Thanks for dropping by. When I click on your name it takes me to the Spartan race site. Are you one of the organisers? What a shame you don't have any in Switzerland yet if so. I am sure something like that would be popular here too - Switzerland is an amazingly sporty country.